Seattle Neighborhood Greenways is a grassroots people-powered movement. This is an ambitious list of projects that we simply can’t make happen without our local chapters and engaged volunteers like you! Get involved. Safe Routes to School: Every child deserves to be able to walk and bike to school safely and comfortably. In 2019 we’ll be working with ten school communities to advocate for more safe routes to school funding, policies that prioritize walking and biking, and more crossing guards. Basic Bike Network: The heart of our city should have a safe and convenient bike network. 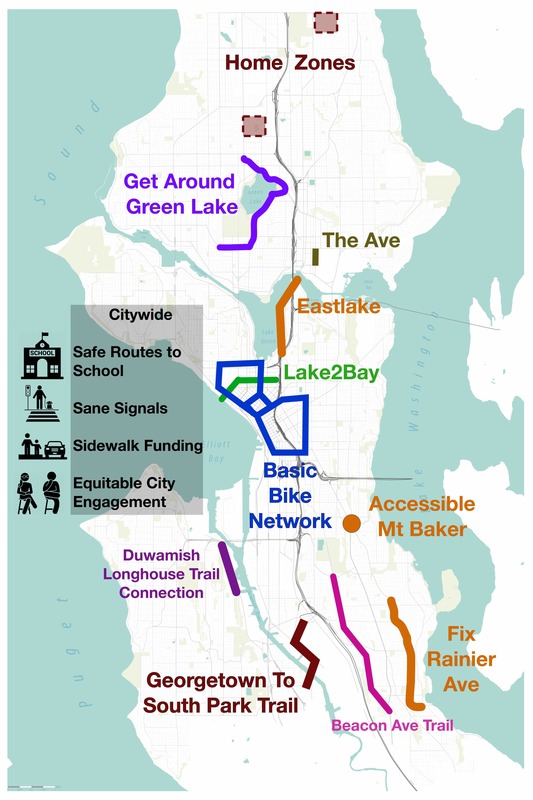 In 2019 we’ll make sure the city follows through on its promises to connect the downtown bike network to the Westlake trail, Broadway protected bike lane, and the Delridge protected bike lane. Georgetown — South Park Trail: Georgetown and South Park are two neighborhoods that each have daily necessities that the other lacks, but remain divided by a dangerous road. We’ll work with local organizers to advocate for the creation of a trail that connects people in these communities to where they need to go. Lake2Bay: Thomas St in South Lake Union will soon be re-knit over highway 99, providing an opportunity to create a green, peaceful refuge amongst the hustle and bustle of downtown that connects people walking and biking from the Cascade P-Patch to the Seattle Center and the Waterfront. In 2019, we’ll rekindle the effort to realize the potential of Thomas St. Accessible Mt Baker: The Mt Baker light rail station is divided from the bus station and Franklin High School by one of the most intimidating intersections in the city. In 2019 we’ll work alongside community members to co-create a sustainable, affordable, and accessible neighborhood. Sane Signals: People walking should be prioritized, not penalized, when crossing the street. In 2019, we’ll advocate for a comprehensive signals policy that reflects our city’s values and priorities. Home Zones: Every neighborhood should be safe to walk in. In 2019 we’ll help the city pilot a Home Zone that will make an entire neighborhood safer and more comfortable to walk in. Fix Rainier Ave: Rainier Ave is Seattle’s most dangerous street with a crash every day. In 2019 we’ll make sure the city keeps its promises and implements improvements to make it safer for everyone to travel in the Rainier Valley. Get Around Green Lake: Get Around Green Lake will connect the people to where they want to go by advocating for better bike lanes and crosswalks to make it easier to walk and bike around Green Lake. Sidewalk Funding: It will currently take well over 300 years to build sidewalks on the 26% of Seattle streets where they are missing. In 2019 we’ll work to support new sources of revenue to build sidewalks where they are most needed. Duwamish Longhouse Trail Connection: The Duwamish Tribe’s Longhouse is currently divided from Herring’s House Park, which they use for cultural events, by a fast moving four lane road and train track. In 2019 we will support their Neighborhood Street Fund application to fund a better crossing here and eventually a seamless connection to the Duwamish Trail. Beacon Ave Trail: The Beacon Ave Trail the runs down the middle of the street is currently chopped up by difficult crossings and not fully accessible. In 2019 we will support a community Neighborhood Street Fund application to improve the trail. Equitable City Engagement: In 2019 we’ll continue to advocate for equitable City of Seattle engagement policies and practices. Eastlake: In 2019 we’ll support neighborhood advocates who want to make Eastlake Ave a safer and more comfortable place to walk and bike. The Ave: In 2019 we’ll work to reinvision The Ave as a space that prioritizes people and small businesses, not just a passthrough.